This laser unit is one of six that repel thieving birds from the blueberry fields of Meduri Farms near Jefferson, Ore.
Orchard manager Justin Meduri says he is thrilled with the results of the laser system protecting his crop. "There's not one bird that you see flying around," he says. Meduri says he previously hired a falconer to protect his fields. But the falcons were expensive, temperamental and sometimes flew away. 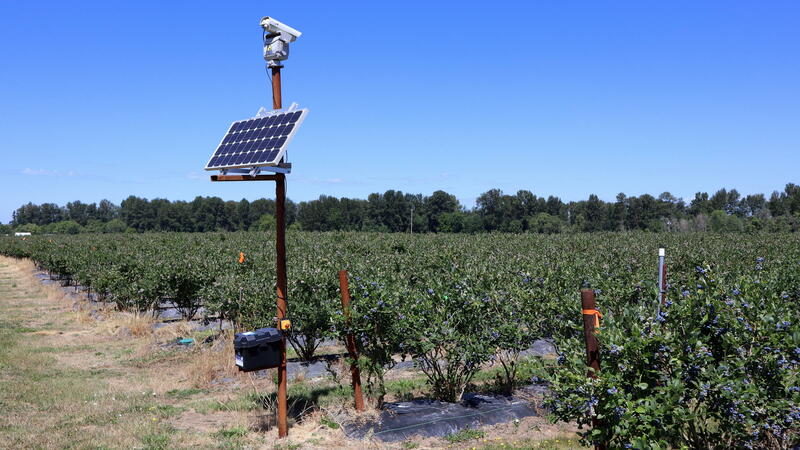 Then last year, he became one of the first farmers in the U.S. to install automated lasers. "You're creating this kind of laser light show at 4 o'clock in the morning," Meduri says. "That's the time when birds come out." Meduri is thrilled with the results. "[The lasers are] running right now as we speak. 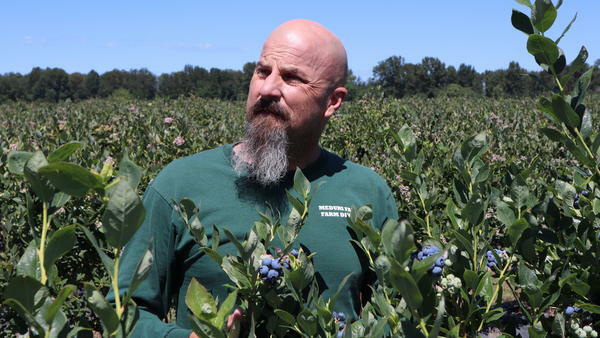 You're out here in over 175 acres of blueberries," he says, punctuating the observation with a staccato of hand claps. "There's not one bird that you see flying around." Meduri says that had any birds been in the bushes, the clapping would have made them come out. "Oh, yeah. They spook," he says. "It's pretty nice." A Netherlands-based company called Bird Control Group made the six lasers that Meduri first rented, then bought. The company's director of North American business development is Wayne Ackermann, who's based in the Portland area. Ackermann says the lasers are catching on. "In the Northwest, the applications we have sold them for so far have been blueberry growers, cherry growers, vineyards and some Honeycrisp [apples]. We've got one going in on top of a grocery store in the greater Seattle market," Ackermann says. Bird Control Group started out in Europe, for the most part using lasers to shoo pesky birds away from industrial sites and airports. In the U.S. market, the agricultural industry appears to be the most promising. Ackermann says some of his initial sales have come from farmers trying to appease neighbors. "One grower in eastern Washington was the first to bring this to my attention," Ackermann says. "He's a cherry grower and he said he was having a combative relationship with one of his neighbors." The silent lasers proved a friendlier — and sometimes better — bird repellent than traditional tools such as propane cannons or squawk boxes. The lasers are also friendlier than using poison or a 12-gauge shotgun. One automated laser unit costs about $9,500, which Ackermann says qualifies as "affordable" for commercial farms. The company offers free laser safety training. That's important because lasers can burn your eyes if you look into them. It's the same danger as pilots being blinded by irresponsible people aiming laser pointers into the sky. Bird Control Group says it programs its automated lasers to always shine the beam downward. It also recommends that fields be posted with signs to keep strangers out when lasers are in use. Researchers at Purdue University are studying the risk of injury to birds. Principal investigator Esteban Fernandez-Juricic says very little is known about whether lasers can harm the animals' retinas. "What we are trying to assess is whether different levels of energy output of these lasers and different levels of exposure time could cause any kind of retinal injury on the animal," Fernandez-Juricic says. "These retinal injuries could potentially be pretty serious and affect the ability of the animal to see and consequently to find food, mates or refuge." Fernandez-Juricic says he hopes to release preliminary results in three to six months. He says that so far his team has come up with some "interesting results," but the data need to undergo peer review before public release. A marine scientist from Seattle encouraged and supported Fernandez-Juricic to tackle safety and efficacy questions. Washington Sea Grant's Ed Melvin says that his interest stemmed from an experimental deployment of a laser unit on a commercial fishing boat off the Oregon coast. Melvin says fishing vessel owners were curious if laser beams could deter deadly seabird interactions with fishing gear. He raised a complication, the risk of retinal injury to protected species such as the endangered short-tail albatross. The initial trial with two onboard lasers in 2015 found wide variation in seabird response depending on the species and time of day. "The jury is out whether, and to what extent, this is effective," Melvin says. Ackermann says birds perceive a laser beam differently than humans, probably seeing it as a physical danger coming at them. "It's like someone waving a stick in your face," Ackermann says. "At some point, you're going to say, 'I'm not welcome here and I'm going to leave.' "
Ackermann describes a rapid growth curve for the business in North America starting from 20 to 25 laser units being deployed on farms last year, rising to about 100 this growing season. Next year, he anticipates selling 300 or more lasers for bird deterrence, including expansion into newer sectors such as oil refineries, warehouses and dairy feedlots. This story comes to us from the Northwest News Network. You can listen to the audio here. As the 2018 midterms approach, there's one issue that threatens to separate President Trump from his base - tariffs. GARCIA-NAVARRO: Those are the cows of Vision-Aire Farms in Eldorado, Wis. This farm is owned and run by Janet Clark and her family. JANET CLARK: And it's getting to be feeding time, so they're going to - now that they hear me, they'll start yelling in a little bit here. GARCIA-NAVARRO: She's the second generation. And, as she walks us around, the third generation - her kids and her brothers - are giving each other rides on the farm equipment and helping out nursing baby calves. UNIDENTIFIED CHILD: We're going to go feed these ones. I'm not feeding the one that was born. GARCIA-NAVARRO: It's a beautiful farm. Immaculate, really. A barn nestled in the greenest hills surrounded by corn and sunflower fields. CLARK: Every day, I start out at 5:30 in the morning. I'm here feeding calves 'cause that takes me about a couple hours to feed calves. GARCIA-NAVARRO: And she'll tell you it is hard work even in the best of times. And these are not the best of times. CLARK: The last two years have been the most challenging. Prices have been very stagnant. Our milk prices have been kind of low. GARCIA-NAVARRO: Dairy is particularly vulnerable to fluctuations in the market. UNIDENTIFIED PERSON #1: Cows need to be milked. They need to be fed. CLARK: They need to be milked. There's no valve to shut off, right? (Laughter) It's not like some industries. GARCIA-NAVARRO: Into this mix came President Trump's announcement of steel and aluminum tariffs on Mexico, Canada, the European Union and China. And it didn't take long for countries to slap retaliatory tariffs on iconic U.S. products, including dairy. And since a big part of Wisconsin's dairy goes abroad, that's been a big problem for farmers like Janet. CLARK: We have created relationships with the people that we're exporting with, and we have really good relationships. Now they're going to back off and not buy from us. So then that gives - that opens the door for other people to come in and create those relationships. GARCIA-NAVARRO: And she's worried that clients like Mexico will start buying cheese from, say, Italy instead of Wisconsin, and American dairy won't get those hard-won relationships back. Trump's tariffs are a complicated subject for many farmers in Wisconsin. Rural communities swung hard for Donald Trump in 2016 and contributed to his victory. Janet supports the president, but she's worried. CLARK: How much time do some of us dairy farmers have? We've already lost a lot of dairy farmers along the way. He's in the - he's going to be the president for the next couple of years, so that is what we have to give him the time of. And, hopefully - that what he's doing is making the right decisions. And I think he's going to be a good leader in what he does. GARCIA-NAVARRO: To get the pulse of the rural vote, and some chocolate-covered fresh gouda on a stick, we head to an important event for anyone who deals with cattle. UNIDENTIFIED PERSON #2: Welcome to the state fair. Have a fair-tastic time and a wonder-fair evening. DAN ANGOTTI: A little town called Freedom in Outagamie County. GARCIA-NAVARRO: Oh really? It's called Freedom? That's great. GARCIA-NAVARRO: How did it get that name? ANGOTTI: (Laughing) I don't know. GARCIA-NAVARRO: And he says, when it comes to trade, it was time to shake things up. ANGOTTI: Everybody's been getting away with everything for so long. And the United States is - I believe it will get straightened out. And it will. GARCIA-NAVARRO: How much time do you think farmers will give him? How much time will you give him? ANGOTTI: Me? As long as it takes. GARCIA-NAVARRO: So I take it you're a supporter of the president? ANGOTTI: He's our president. I will support him. GARCIA-NAVARRO: But a few stalls down, Jeff Leahy from Lafayette County feels that the farming community is paying an unfair price for the president's strategy. JEFF LEAHY: They're using ag as leverage, and that's not fair to us 'cause they're using us to get the other tariffs on metal and whatever other stuff that we're out of whack on. They're using food to do that, I think. GARCIA-NAVARRO: So, let me ask you, what do you think about the president's sort of strategy? LEAHY: I think he did it too quick. You just can't go and say, I'm going to do this and not realize who it's going to effect. GARCIA-NAVARRO: A couple of weeks ago, the Trump administration announced up to $12 billion in emergency aid for farmers caught in the trade war. But farmers we talked to said they want trade, not aid. LEAHY: Twelve billion dollars. But how are we going to get it? Who's going to get it? GARCIA-NAVARRO: These farmers are a key constituency for the top two Republican candidates fighting to take on the incumbent, Democratic Senator Tammy Baldwin. Leah Vukmir is one of them. And naturally, she's also at the state fair, where she's reaching out to potential voters for this Tuesday's primary elections. LEAH VUKMIR: Well, thanks for saying hi. I do appreciate it. UNIDENTIFIED PERSON #3: Oh, well it was very nice seeing you. VUKMIR: Thank you. I'd love your support August 14. GARCIA-NAVARRO: Vukmir is a registered nurse and a state senator. She's got the establishment behind her. She's been endorsed by Wisconsin's own Paul Ryan, speaker of the House, and the state GOP. These days, if you're a Republican here, you have to be all in for Trump. VUKMIR: I want America to succeed. And he is leading that charge. And that's why I want to stand with him in Washington to help. GARCIA-NAVARRO: She's also standing with him on tariffs. VUKMIR: I'm amazed at the number of farmers who are telling me, we're already in a bad situation. If he can make it better, we're going to give him the benefit of the doubt, and we're going to give him the time. GARCIA-NAVARRO: Vukmir's chief rival is Kevin Nicholson. He's a decorated combat veteran and a business consultant. We meet him at another iconic political stop - Miss Katie's Diner in Milwaukee. KEVIN NICHOLSON: It's clear as day this is what the president's trying to do - is let's bring our trade partners back to the negotiation table and eliminate all tariffs. GARCIA-NAVARRO: On the menu, the corned beef hash skillet they served to Hillary Clinton and the bacon skillet they served to then-candidate Donald Trump. Safe to say that Nicholson was into the bacon skillet. But Nicholson echoes what his opponent says on trade. NICHOLSON: What I would point out is the status quo is unsustainable for the people of Wisconsin. The status quo that says Canada, EU, China, India are allowed to slap tariffs or to engineer their economies in such a way that they protect their own industries while we do not do the same - that's what's really been bad for the people of Wisconsin. And that's what needs to change. TAMMY BALDWIN: They have been drafted into a trade war that was not of their making. GARCIA-NAVARRO: Democrat Tammy Baldwin, the senator they're hoping to unseat, has fought Trump on his tariffs every step of the way. She's one of the 10 Senate Democrats running for re-election in states that went for Trump. Republicans across the country are pouring millions of dollars into the race to defeat Baldwin. And her position on tariffs is a stark contrast with her GOP rivals. BALDWIN: Canada and Mexico and the European Union are not the problem. And the idea that Trump administration has decided to not exempt those countries is - it defies imagination, and it's not smart trade policy. In fact, it's leading to this trade war. GARCIA-NAVARRO: She thinks Trump and the GOP are out of touch with rural voters now. BALDWIN: I think the situation is urgent. I don't hear those who are living on the brink right now saying, we can stand much longer. GARCIA-NAVARRO: But for Baldwin to win, it isn't just farmers she needs. She has to bring in another crucial demographic - African-American voters. Elsewhere in the show, we'll head to Milwaukee and hear from them. Transcript provided by NPR, Copyright NPR.